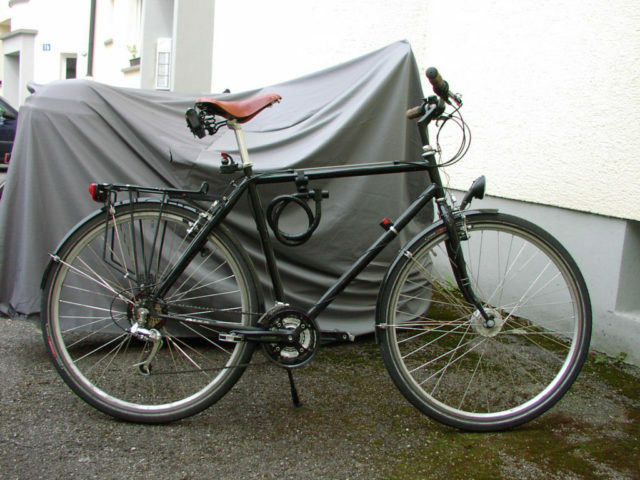 This bicycle doesn’t exist anymore – I had to give it up after the frame was broken. The base was a bicycle with a steel frame and 21-speed gears, which I bought around 1998 about 300 Euro. 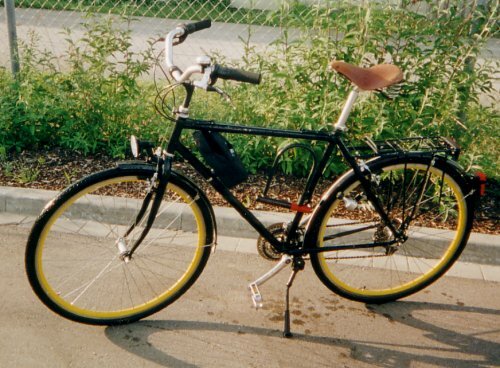 In the original condition there where no fenders, no rack and the configuration was generally on a low level (Shimano Acera, very simple cantilever brakes, rock hard cheap saddle made of plastic etc.). During some years many parts where added and many of the standard parts where replaced. If the frame wasn’t broken, I would still drive it. Some of the parts, like the hitch or the lights went to my second bicycle, where they still provide good services. Around 2004 with more suitable “everday” equipment like hub dynamo etc.